Hey everyone. Kevin Fleming here and I just want to take a few moments to share a little bit more of a personal story about why I do what I do. It’s a good question that I get asked a lot and I pull out a great book title to answer that question, a book by James Hillman entitled “We’ve Had 100 Years of Psycho-Therapy and the World’s Getting Worse”. It’s a good title and please don’t take it the wrong way. I have many psychologist friends and counselor friends and therapist friends who are doing amazing work in the field and certainly that was my training. I went to Notre Dame undergrad and graduated and learned a lot of great skills in the therapy world, but like the title says, the world seems to be needing something greater than just psycho-therapy and I guess I felt called to sort of fill that void a little bit and when I was practicing, I felt personally a little bit incomplete. There were a few issues that helped me drive away from that field and help me create my own proprietary processes and models around behavior changes. You see, day after day I would have dialogues with people around change, hopes, dreams and pain and we would have many dialogues and there were honestly days I wasn’t the best self I could be, yet I was always called “brilliant” or that this hour was the best hour they’ve ever had and I thought that was very interesting that words were not only helpful in healing, but also had a lot of illusions as well and if we didn’t do something beyond just have dialogues with people, we’d all be stuck in changing the world so I guess I felt noble in some way to kind of get out there and do some bigger, larger work with people. The other issue I think of why I left and created my own practice of different types of thinking was the brain. After studying neuro-science for years, I realized the psycho-therapy process as I looked at it didn’t really align to this whole under world of the brain, that there were these bubbles above people’s heads that were very different from what we said in therapy that really end all be all the truth that were driven along by neuro-laws and neuro-science laws of how we just reduce end all be all and pain just to make ourselves feel good and do some rationalizations and such and that was disturbing to me because I think the brain was working against us all the time in there so I’d like to study that and try to find the truth there in the brain. Lastly I think why I left was an Einstein quote that means the world to me, which is this quote where he said “no problem is ever solved in the same level of thinking the problem got created on”. To me, I think that’s a real radical call for end all be all change of thinking. People that are really willing to turn over assumptions and do things wildly different from what we’ve done and that’s why I do what I do because it’s meaningful and awesome work. Bradley: Our guest today is Kevin Fleming. 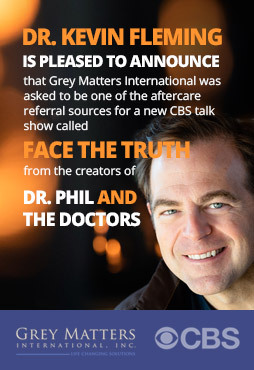 He is a PhD and a former neuropsychiatrist and President, CEO and founder of a unique neuroscience consultancy and coaching firm called Grey Matters International. He’s here to talk to those of us that are employers, those of us that are employees, those of us who want to work better and make things better for us. Kevin, welcome aboard. Kevin: Hey thanks. Good to be here Bradley. Bradley: Good to have you. So tell us, what is so important about letting our job work for us as opposed to us working for our job? Kevin: I’d say it’s becoming a lot more critical of a question now mainly because information overload is such a reality. Brad: Information overload? You mean they’re demanding too much of us or what? Kevin: Yes in some ways that, but I’m going to argue for the ration of messages coming at us. It’s the chronic nature and there’s no breaks. There’s a great book out, I think it’s a neurobiologist at Stamford, Robert M. Sapolsky, but he had a great title of the book, “Why Zebras Don’t Get Ulcers”. It’s a great title and his whole point is that the reason why in Savannah when a zebra is getting hunted down, there’s a clear delineation between the threat and the resolution. We don’t have that in real life anymore. Everything is 24/7, blended and it’s the virtual sort of we’re all living in one global pond versus all these separate ponds we used to be big fish in. So now everything is coming at us and everything is deemed as equally important so the chronic stress part is very, very dangerous in my opinion. What stress does when it’s chronic, again we all get up and down with stress and we need an optimal moderate level of stress to live, but when it’s chronic and unstoppable and constantly pinging at us, it creates cortisol. Cortisol in the brain camps out right in the end all be all region, just a fancy name for the working, learning part and it riddles it. When that constantly berates us, we have a hard time processing this information, deciding, living well and being balanced so I believe when we’re looking at this work question that you just pitched at me, it’s a big question now and the idea of empowerment being healthy and really being brain centric has never been more important than now. Bradley: What we want to do is make the work environment a better place and in order for it to be a better place, it’s got to be a better place between your ears. Correct? Kevin: That’s a great point. Bradley: That’s the whole deal, whether you’re President or CEO of a corporation or you’re the employee at the bottom of the ladder trying to climb your way up, it’s all important isn’t it? Kevin: Absolutely and here’s where it gets tricky. The brain kind of starts saying “you know what? You’re not giving me a break so I’m going to start tricking you into thinking everything is fine” and the reason it gets dangerous in a way is because it goes into survival mode. The brain goes into this automatic pilot position that’s basically saying “I’ll take it from here”, but you’re really not. It’s kind of like when God forbid there are people out there who have gotten behind the wheel when they shouldn’t when alcohol gets in the way, you start getting that false sense of control. “It’s okay. I know what I’m doing” and the car is suddenly going over here. That’s what happens with the brain when chronic stress is hitting at it. You think you’re keeping your car in the middle of the road, but you’re really not. The guys that call me are executives or mid-level managers. Bradley: Do a lot of executives call you? Bradley: Brain centric stuff. Tell me about that. Kevin: Well, in other words, you can go to a counselor to help you deal with stress and they’ll usually give you things that are rationally true, like go exercise more, go take care of yourself, you’ve got to make sure you get on the treadmill, you’ve got to make sure eat this and that and a lot of times the bubble above the head from the executive says” yeah right”. Have you seen it in my life? You want me to get up at 4 in the morning now and get a work out in? I mean these kinds of things happen and so when these people leave these “information friendly” kind of disease management pamphlet kind of dialogues and they go “you know, that’s not fitting my life. You guys don’t really understand what I’m going through” and I think they’re kind of right. Kevin: Self-directed and optimal. I think that environments can change more about our issues than us fixing it again. What’s ironic about saying “get on a treadmill” is you can feel like you’re actually on a treadmill trying to fix getting on a treadmill and so I think we do more by peeling the onion and going backwards and like you’re saying, going from the environment and working our way back in. Are you sitting in a cubicle with no light? Do you have music on during the day? Music makes your brain so much more creative. Are you doing exercise at least, you can drive your car to work and do crunches by turning your body. I mean there are so many ways you can get to work. You can have an optimal brain walking in the door. Bradley: If someone calls you to be their coach, you know all these things. You’ve prescribed them all before. Kevin: Not only the tips and tools, but almost more importantly, you can go on my website and look at the testimonials from the business folks out there. Bradley: That’s KevinFlemingPhD.com. Kevin Fleming, with one “m”, PhD.com. Kevin: That’s right and what you’ll see in those stories there, I think what you’ll hear most is “I heard the information you gave me before, but the implementation into my brain is different now. You make it seem like it really will fit into my world” and I think that’s the key. I used to be a Director of Training at a health coaching company and we had to work with truck drivers. Talk about a health population. That was very difficult to change body weight, size and health decisions, but we did it. This company that I was working with gave one of the largest trucking firms a 2-1 return on health care investments. Why? Because we went to the level of the truck driver. We drove around in the rigs with them. We got in there to listen to what their fears are. We made sure that we didn’t just give answers like “cut out fat in your diet”. Yeah, right. Like that’s going to work with a truck driver. We made sure that we thought about things like pulling how ever many wheels rig into a parking lot to get their meals. These things are real barriers. Bradley: You bring neuroscience into coaching, right? Bradley: So you’re not just a regular life coach. Bradley: You’re not going to give a one size, one glove fits all. Kevin: Motivate, set some goals. The reason why you’re not healthy in your work Johnny is because you’re not setting goals around health. What? To me, the environment is so incredibly crazy in corporate America in my opinion, that if you try to put just a normal coaching answer on that one, these guys are going to actually get more pissed off. Bradley: Why is neuroscience so important to bring into coaching? Kevin: Because it tempers the right answers you’re giving. In other words, and again I need to put that in the right light. There are a lot of good coaches doing good things with good people at the right time. Bradley: To have a coach is better than not having a coach. Kevin: In many ways absolutely because at least it’s striving towards being better. That by itself is a good thing, right? The problem is it’s kind of like if I’m drowning in the water and this is what it can feel like when you’re doing more traditional coaching with someone in this level of complexity, the way corporate America is. They’re drowning, they’re asking for a life preserver, someone’s sitting there and what we’re doing is describing the water to them while they drown. I think that sometimes that’s what it’s like for these guys feeling in a coaching session. You’re giving me information, but do you really understand the reality of this world, the ocean, the sharks that are going around me right now? Do you understand that there are trade offs to those? For me to be healthier may mean that I have to give up something very, very secure and I’ve got all these other pressures in my life and my wife has gotten used to her current lifestyle and my kids too and you know what? Maybe I am subconsciously putting my health on the back burner to make sure that I perform as a dad and father. These are some interesting dialogues that I think you need to have that are larger scale. A lot of times in great matters, I’m working with the leader, the one they report to, the team they’re on. I’m kind of where many pass because you’ve got to fix the system as well as the person. They’ve got to go hand in hand. Bradley: The company is called Grey Matters. His name is Kevin Fleming. He’s a PhD and also the CEO of Grey Matters. It’s about changing you from the inside, you from the inside out, making you a better individual so that you can take all that is better in life. Correct? Kevin: Correct and being very mindful about the interplay of what is interchangeable within you and what are some perimeters in the environment of corporate America that you just have to know what the cost benefit ratio is. I think that’s my point. A lot of times these guys have no idea that the 24/7 Blackberry they live in is actually causing their pain because there’s not breaks. I’m not saying throw your Blackberry in the ocean and give the finger to your boss, but I am saying demarcations, lines, breaks, time outs. You can become like the zebra in the Savannah that doesn’t get an ulcer. You have to learn what those behaviors are on modern life that will actually make your brain thrive and you’re not going to get them in an HR department dialogue. Kevin: This is a big deal. Bradley: Taking care of yourself is a big deal. Probably as big or bigger than anything else you’re dealing with. Right? Kevin: Yeah. Great point. You want to know why it’s huge? There’s a great statistic out that says if you were facing a life and death situation, again many of these guys are having health issues. They had heart attacks, they have stress related issues. If you’re facing a life and death decision and death is at your door because of some chronic illness diagnosis or something, what do you think the chance is of changing even if someone says “you’ll die if you don’t”. A guy named Alan Deutschman who wrote a book called “Change or Die” did that study and it’s remarkable when I ask that question what people give me numbers on . You have a one in nine chance of actually changing your habits and behaviors even when death’s facing your door. Now that’s remarkable to me so when you say “why do you put neuroscience in your dialogue” because even when someone says “I’m going to die” I still don’t change? Something is going on with my brain at that point. It’s not because I’m not getting nice validation, comments and words from people who care about me. I’m sure I am. I’m sure people around me are saying “you’ve got to do something about this dude. It’s not working”. It’s because there is something very delusional about the brain that happens under stress and under threat. It shuts down. “Change dialogues”? Yeah, right. I’m just trying to stay afloat. When you have that kind of chance of changing, this is important to get engaged with someone like me who can get real with you fast. Bradley: Great. His name is Kevin Fleming. He’s the President and CEO of Grey Matters International. You can call him at 877-606-6161. That’s 877-606-6161. If you’re the President of a corporation, if you’re just an employee or you just want to make your life better for you and your family, give him a call. that’s 877-606-6161. Check his website out at KevinFlemingPhD.com. That’s KevinFlemingPhD.com. Now Kevin, we’ve got about a minute left here on the show. Tell us what’s really important? What can people who come and see you expect to see in their lives? Kevin: Absolutely. What they would expect right away is sort of stripping away some of the illusions that are getting them in pain. In other words, some of this is going to be new behaviors you’re going to learn to make and some are going to be expectation changes that you’ve just been holding onto too tightly that you have to let go of. We’re going to get it right and get it real so you can really thrive. Bradley: That’s wonderful, that’s wonderful. The company is called Grey Matters and he’s Kevin Fleming and my name is Bradley Quick and this has been Your Solutions. Imagine a business on purpose. Yielding the greatest return on correct thinking. Introducing Dr. Kevin J. Fleming, international change agent and the planet’s leading thought expert, taking genius one step further.